On the eve of a special day for this site's owner and operator, comes one of a series of four reviews to close out this shortest month of the year. 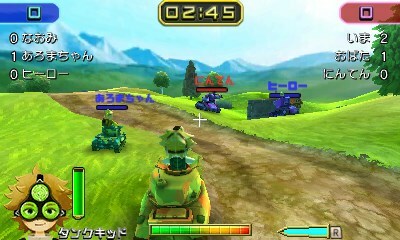 It's for Tank Troopers, a Nintendo 3DS eShop release that launched two Thursdays ago in North America. How is it? Let's find out with this review! Tanks for the memories, Vitei! Developer Vitei is by no means a household name like other studios that have worked with Nintendo, but some may be familiar with its work on the Steel Diver series. 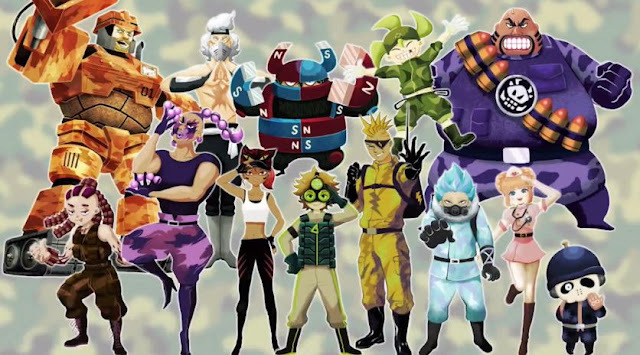 Its most recent game is the Nintendo 3DS eShop exclusive Tank Troopers, a game brimming with personality, right from its whimsical and grin-inducing variety of a wartime ditty. Though lacking a crucial feature for a game like this, Tank Troopers ends up being a worthwhile game with plenty to offer for its modest price. First off, let's get to what I alluded to in the introduction-- the really bad part of Tank Troopers, a baffling omission that might make many prospective buyers of the game completely dismiss it. That omission is that Tank Troopers totally lacks any kind of online multiplayer. It's absolutely crazy that a game that would work so well and have its life extended so greatly through online multiplayer does not have it whatsoever, especially when Vitei's past work, Steel Diver: Sub Wars included it. Instead, all that is present in Tank Troopers is local play for six players who all own a copy of the game and download play, which allows one owner of the game to play with up to five others who do not own a copy. The latter mode is quite limited, only offering one map and everyone being stuck with the same tank with no choice in the matter. Local multiplayer offers three main modes across five maps, all of the maps seen in the single-player experience, which I'll talk about in just a little but. Taking out opponent tanks and dealing damage is the main draw of the multiplayer, and it supports three main modes: a mode pitting all tanks against one another, a team-based deathmatch mode, and a cool Bomb Battle mode, where teams try to push and roll a bomb into the opposing team's base. Tankfully-- I mean... Thankfully, you can team up in one of the three available local multiplayer modes. Despite lacking in online multiplayer, I still find Tank Troopers to be more than worthwhile a purchase. This is because of the single player component of the game, offering 30 missions that need to be completed in a linear order. While being forced to do each mission in a strict sequence can be annoying due to some missions that pop up having massive fluctuations in difficulty (especially ones where you have to transport a ball of some kind across the map or push/shoot it into goals), it's overall not too much of an issue. The 30 missions seen in Tank Troopers have a great variety to them. There are simple missions where you need to destroy a certain number of tanks, ones where you need to reach the goal, ones where you take on a monster-sized tank with both great offense and astonishing defense, ones where you need to defend a base, and many others. These missions have two forms: one where you take orders, meaning you're stuck with a specific tank and set of helper characters; and one where you're able to select whichever tank and series of troopers you like. With both forms, there's the need to complete each mission twice, once in each mode. Weirdly, even if you've already unlocked all of the missions in one form, you still need to complete the missions in order in the other form. This shipyard area is one of the five available maps in Tank Troopers. Each mission is scored depending on a number of factors each depending on the current mission. These factors can be things like how fast you completed the mission, how many enemies in tank or turret form you dispatched, to things like how much health you have remaining at a mission's conclusion. The best rank is an S, and completionists will have trouble but a good deal of fun trying to get the highest rank in all of Tank Troopers' missions. And here I thought *I* had a big tank! As you complete missions and compete in multiplayer skirmishes, you earn money that be spent on a multitude of things, such as new tanks, new paint jobs for said tanks, as well as new troopers. Each tank has its own set of strengths and weaknesses, as well as stats like firepower, how long it takes for a given tank to reload its ammo, defense, health, and speed. Additionally, each tank can support a handful of troopers in it, called upon by tapping their icon on the bottom screen. This engages them, giving your tank a special perk or ability for as long as that trooper's gauge has some juice in it. The gauge depletes automatically over time and much more so when your tank takes damage. Once a trooper's gauge has been depleted, it takes a little while for it to recharge, allowing you to call them back into action. The troopers' abilities range in both offensive and defensive bonuses. Some unleash larger, more devastating bullets at targets, some shoot out a ball of paint that partially covers the damaged player's screen, while others give tanks a quick boost of speed to travel across the battlefield faster, or slowly regenerates the health of a tank. Trooper Big Gunnar's name is fitting due to the super-sized shells he shoots out when called upon. Controlling the tanks in Tank Troopers is a thankfully terrific experience with a small learning curve. Turning and such is performed with the Circle Pad while the A button moves the tank forward and the B button reverses its treads. With a tap of the R button, a tank unleashes a shot, and once the small bullet icon on the lower portion of the upper screen refills, another shot can be taken. L enables artillery mode, which allows your tank to move forward and backward while giving you 360 degree control of the turret. However, I found this mode to be mostly unnecessary, but it is nice to have regardless depending on your skill level and play style. You can aim with the help of the Nintendo 3DS's gyroscope controls, or you can turn them off like I did in order to keep the distance-judging stereoscopic 3D effect in place. Finally, the X button brings up a scope function, great for trying to pick off foes from afar. All in all, the tanks in Tank Troopers generally control well. While it's definitely obvious that the lack of online multiplayer undercuts some of the value of Tank Troopers, the content-rich single-player experience (though lacking a story that ties it all together), the ability to try to S-Rank each of the game's 30 missions, and the constant gathering of currency to buy new tanks, paint jobs, and troopers make for a digital game that for me made the game very much worth its $7.99 price tag. Jump into a tank and start unloading rounds into the enemy, soldier!